 Bayside Shakedown 2 is also available in special 2-disc "International Version", with THX sound mixed by those fine fellas at Skywalker Sound. Be warned, this version of the film has been trimmed by eighteen minutes to make it more palatable for Western audiences. And to think the filmmakers willingly did this to themselves. The Skinny: Sequel to the blockbuster Bayside Shakedown is pretty much more of the same. That means its largely free of action, but given to engaging characters, fascinating human themes, and perhaps a little overdone melodrama. Regardless, this is an effective, entertaining commercial flick. Back in 1998, Japan released a little movie entitled Bayside Shakedown: The Movie. Based on a popular TV drama, the film was not what one would expect from a big-budget asian film about cops. Instead of car chases, explosions, or other assorted red-meat activities, Bayside Shakedown featured office politics. That's right, the biggest problem in Bayside Shakedown were the issues faced by the regional Wangan Police Station as a small potato in the giant Japanese political machine. The main character, Aoshima (singer Yuji Oda), was a passionate detective fed up with the bureaucratic red tape foisted upon he and his partners by the bigwigs in the big city. His solution to the problem: to work harder. That's not what Bruce Willis would do. Aoshima and the entire cast of Bayside Shakedown return for Bayside Shakedown 2, a bigger sequel that promises more of the same. Bureaucratic stonewalling and mildly funny office politics are the featured conflicts here, though you will find some actual criminals and even life-and-death issues. Aoshima is fed up with the Wangan Police Station's lack of juicy crimes, and is stoked when an actual murder shows up locally. His current case, a guy who bites pretty young girls, isn't exactly filling his cup with excitement. The problem: the big city law enforcement sends in their big guns, which means people in suits who are good at talking to the press and giving orders. The nominal leader is Okita (Miki Maya), appointed to lead the operation because she's a woman, and it looks good to the press to put women in charge. She's aided by Muroi (Toshiro Yanagiba), a stone-faced ally of the Wangan Police Station, who understands that cooperation between the various levels of law is the best idea. However, he's pushed aside for Okita's high-handed ways, which use the local Wangan cops as cannon fodder. She also plays things too close to the book, and generally buries any effective law enforcement beneath large meetings and mounds of red tape. Aoshima and his fellow partners put up with the bureacratic BS for a while, but eventually decide to do things their own way. That means they grab a bunch of shotguns and run after the bad guys, right? Wrong. Nobody gets a gun; this is Japan, where cops aren't normally assigned firearms. Instead, Aoshima and partner Sumire (Eri Fukatsu) go about their menial assignments while grousing inwardly. They also try to tackle their personal cases. For Aoshima, it's the girl biter, while Sumire has a "family" of pickpockets to watch out for. Also, someone around the office is having an affair with the chief, which is sending everyone into a tizzy. And there's menial crap to do for Okita, including surveillance of public phones, and witness babysitting jobs. Where's the tension? Well, it's all in the characters and the insane attention to procedural detail. 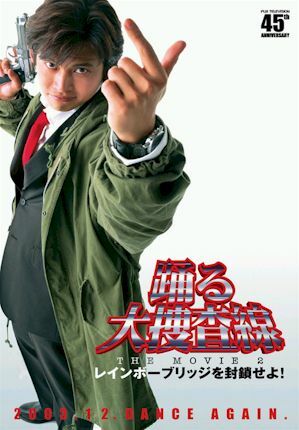 Director Katsuyuki Motohiro spends oodles of time following the routine aspects of the investigation AND the hosting of the big-city cops at the smaller Wangan Police Station. Accomodations must be made, computers set up, and food prepared for the big city cops. Meanwhile, the locals have to make do with Cup 'O Noodles, and not the fancy bento boxes given to Okita and her gang. Aoshima and Sumire want to solve their own cases, but the higher-ups won't let them because they're not as "important" as their big media case. Eventually, something's gotta give, and it doesa full 100 minutes into the film (Which clocks in at *gasp* 138 minutes!). By the time someone decides to disobey orders, it's already waaaaay into the picture. In an American movie, disobeying orders happens at the 15-minute mark. What are these Japanese filmmakers thinking? Differently, would be the answer to that question. As mentioned before, the big issue here is bureaucracy, and the passionate abilities of the Wangan locals versus the stodgy by-the-book rules of the big city boys. This is a subject that sounds incredibly boring. Well...it's not! The droll depictions of bureaucratic conflict in Bayside Shakedown 2 are funny, and given to understandable, understated human drama. Likewise, the characters of Aoshima, Sumire and the rest are supremely likable thanks to their blue-collar work ethic and local good guy values. The film does have the benefit of being an extended sequel (to another film, as well as an 11-episode TV series that also had 3 TV specials), meaning the characters don't have to grow on us. Presumably, we like them already. And if you don't, then you should probably stop reading right now and go to Blockbuster Video to rent Universal Soldier 23. Ultimately, Bayside Shakedown 2 will likely make few converts to the Bayside Shakedown fandom, which is fine. The TV series and films have a gigantic fanbase in Japan, so they don't really need you, anyway. But if a person did happen to watch Bayside Shakedown: The Movie and did find the exploits of these average cops without guns to be entertaining and even enjoyably low-key, then Bayside Shakedown 2 would likely be just as rewarding a film experience. Uninitiated viewers may not want to break the bank to see the film (Bayside Shakedown 2 is currently only available as an expensive Japanese DVD), but fans of the original film or TV show will likely be okay. They should be so inherently enchanted by the characters and human themes that they'll forgive the film's occasional sloppiness (one moral issue - the usage of a freedom-stripping surveillance system to monitor civilians - is brought up, then completely forgotten), and eventual shift into righteous melodrama ("Hey everyone, we MUST work together for the good of all!"). It's a commercial movie, after all.